It has taken me a while to write again post-Lucy. At first I slumped into an emotional, angry, numbed grief period and then I climbed back up and settled into something more manageable and remembered – the steady self-reliant routine of talking to Hercules, the clouds and myself more than anyone else. Whereas at first the miles to the coast and the powerful vastness of the mighty North Atlantic felt like too big a void to contemplate toute seule, now I am somewhat more adjusted to the idea, as much as I wish it were otherwise. Looking forward to seeing Lucy again in Cape Cod pre-departure, there is another part already pining at the goodbye, a lump in my throat if I think on it too much. I had a long chat with Briony (my psychotherapist) when I was in Chicago last week and we tried to work out why things felt so different this time to previous oceans. I am more wary this time, seemingly more nervous of the consequences of things going wrong and the idea of not coming home. I think it has something to do with chatting through the Pacific 2012 saga with my weather router Lee when Lucy and I were in Minneapolis a few weeks ago, coupled with the fact that Lucy and I have now been together longer and more recently in each other’s company 24/7. We are more in love than ever, if ever it was possible to be even more in love than before. Even though there is a risk that each of us might not come home if we pop to the supermarket or do any realm of x,y,z things, the ocean represents extreme isolation and a multitude of unknowns and potential ‘biggies’. Another thing that is very different this time to last time is that after the 2013 Pacific row I became severely allergic to many things, including mould. As my team and I sort the medical kit for this row, we have to consider the chance of me having a big reaction at sea – to mould, to something new. So long as I don’t become allergic to the sea – for then I would be in an insurmountable pickle. These are not reasons to stay ashore – not yet, at any rate. If it was medically unsafe for me to put out to sea alone then I would have to heed the advice, but for now we are working on ways of managing the risks and niggles and bothers and worrysome bits. Just as before, the training, the planning, the talking and support systems in place will ensure that I am as safe and tracked and supported as possible. And the rest is up to chance. As for Lucy – we just have to keep on, keepin’ on, living together and apart all at once, moment by moment, day by day. We speak when we can and are in regular messaging/email contact. I live a double life of biking and lambing at the moment (Lucy is a farmer) though at least now I am brave enough to look behind me on the bike. At first when she left I called out often but wouldn’t look behind – willing her to be there. How curious that the above words just put themselves onto the page like that. 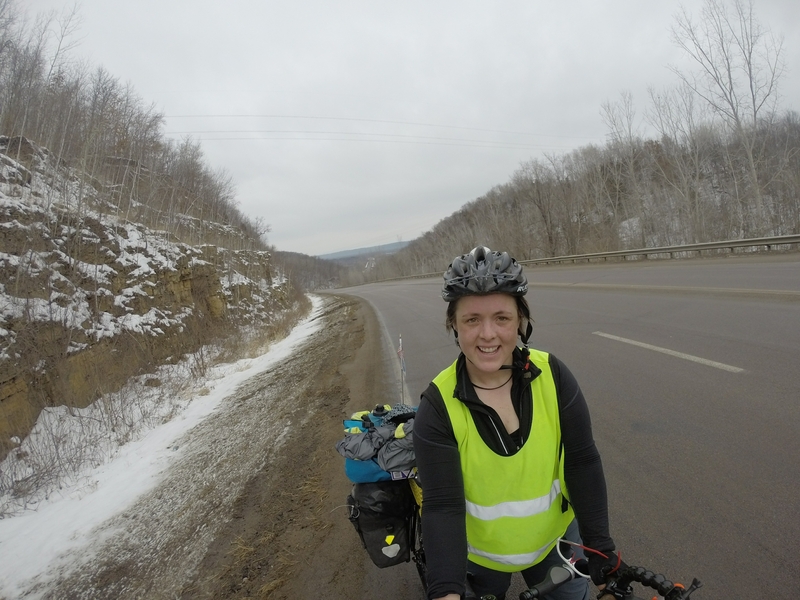 About an hour ago I was chatting to my pal Emily Chappell up in Canada, swapping stories from the road (she is currently biking Anchorage to Seattle – see her blog thatemilychappell.com) and I didn’t know what to write about. It seems that my fingers did, however, describing my present mental landscape instead of the beautiful physical landscapes that have kept me busy these last couple of weeks and the characters who have peopled my days. I followed the Mississippi in all her patchwork glory for a couple of hundred miles, puffing up and rolling down high bluffs that lined her banks, mostly in bright sunshine, accompanied by eagles and watched by fluffy cows with icy beards. I turned East through Wisconsin, wheeling past farm after farm and yet more cows, some of them newly arrived into this world and breathing fresh the crisp days as I was. And then it snowed. 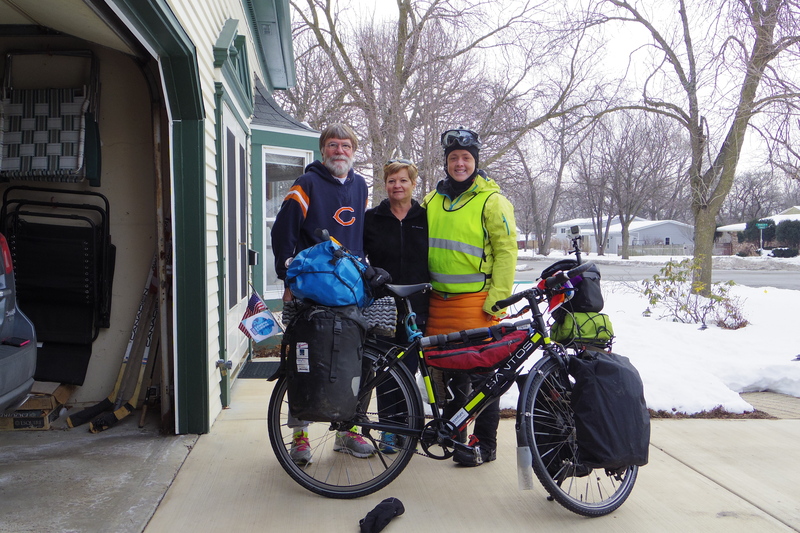 A blizzard grounded me in Argylle with a friendly family, forcing a welcome rest upon mind and body for a day before I pushed on eastward, yet more snow slowing things past Illinois’ third biggest city, Rockford. Here I met some real heroes – a firefigher who told me stories of families losing everything in house fires as they struggled to heat their homes with open-doored ovens or overloaded electric heaters. And Beth, the foster mother who teared up as she told me about her two fostered lads, hungry for attention and love after a sad start to their young lives. And then there was Lou, the unconventional, outspoken, somewhat potty-mouthed arch-something-or-other from a local church who had walked across the U.S in support of those in poverty, with a hope of ending the P-word someday. Jay picked me up outside of Chicago to drive me to the city in his huge mobile pizza-oven-pulling wagon, swapping tales of bike trips of years past. 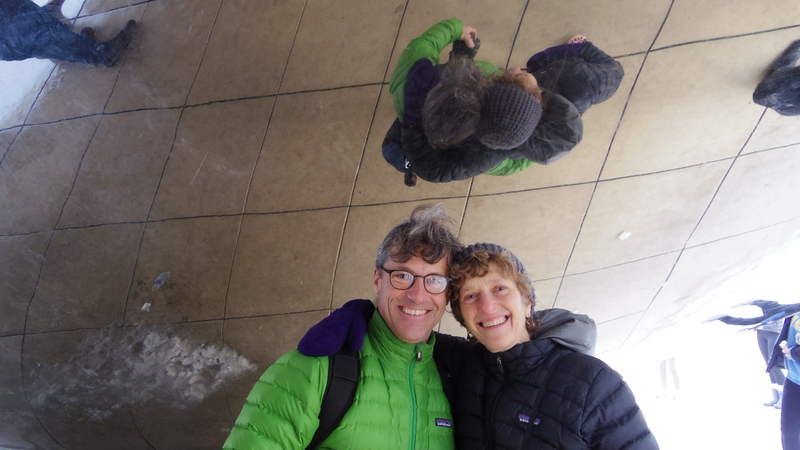 The Bloyd-Peshkins hosted me as one of their own for my time in the Windy City, feeding me with delicious food and company, laughing or talking away the niggles and worried bits, and showing me the sights about town. Bonnie Perry hosted me for a talk at All Saints and the lovely punters donated very generously to the expedition. 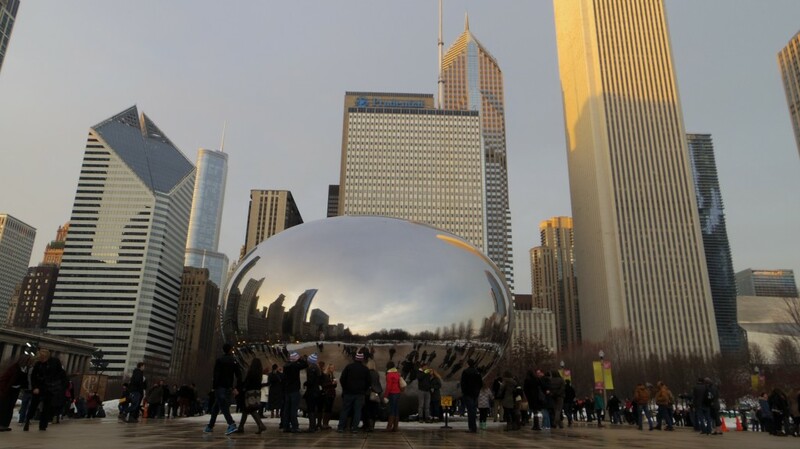 We had a happy hour wandering amongst the park visitors, watching skaters on the ice ribbon beneath towering high-rises and admiring the smooth lines and reflective form of the ‘bean’ as people studied it and themselves in their own little bubble. I even had a paddle, enjoying being back in a kayak after six months away from the water, joining in after Sharon and Alec had finished their coaching session. To be with kindred, outdoorsy spirits with the shared connection of Justine and many mutual pals in the paddling world was comforting, refreshing and a whole lot of fun. The couple of hours spent ‘under the thumb’ as Gina the physio righted the wrongs in my back and legs were painful but productive, as were the hours Hercules spent in Dan’s Bike Shop. Both bike and rider left feeling rather refreshed, though sorry to be leaving new friends. And then there was lovely couple Joey and Bob who came out to find me by my riverside campspot last night after Joey found out that Bob hadn’t invited me in when I called to ask for camping spot advice! We had a lovely evening together and Bob ran the first three miles with me this morning. When Lucy flew home, someone reminded me of the Winnie Pooh quote about being lucky to have someone to feel sad about saying goodbye to. Another pal today sent me a poem by Carol Ann Duffy, ‘World’ – all about passing the moon and rolling the sun to the one you love when across lands or seas. I hear WTP and love it when I see the moon to talk to or imagine the sun being passed back and forth between us and I am realising more than ever that love is the biggest motivator to get home asap. Thanks to: Team Fischer, Team Bloyd-Peshkin, Jay Jones, Bonnie Perry, Lou, Beth, Gina Kolk of Integrity Physiotherapy, Kevin of Dan’s Bike Shop, Joey and Bob, Jay Shefsky and crew of Chicago Tonight, and everyone who came to the talk at All Saints. Thanks Sarah for all your honesty in todays blog. It makes me think that a such lot has to do with trust. Trusting the people you love, (even if or especially when they are miles away), trusting in your own abilities and decisions, generally trusting that life is good and worth every minute! Aye indeed to that, Sarah! That was blatant honest. Loved it. Amazing how we go off and seek then find what we were looking for right there at home. You hang in there. Quite! I met Lucy after the Pacific rescue of 2012 in early 2013. So I am glad that it happened the way it did. It was a great pleasure spending several days with you, Sarah. Alec and I are looking forward to time together with you and Lucy in the future. Absolutely 🙂 I had a great time with you both. Thanks indeed. Oh Sarah…just remember that this is YOUR adventure! Whether you row the Atlantic or not, it’s YOUR call. I am grateful for every sea mile and land mile you’ve allowed me to share thus far! Just wanted you to know that!! Having lost my husband to Pancreatic Cancer 6 years ago, I can full well appreciate the desire to be with your partner – living and sharing life!! Follow your bliss, Sarah! Thanks for sharing. The Atlantic is calling and I am excited for it – just wary of it too and keen for the other side so that I can be with Lucy. 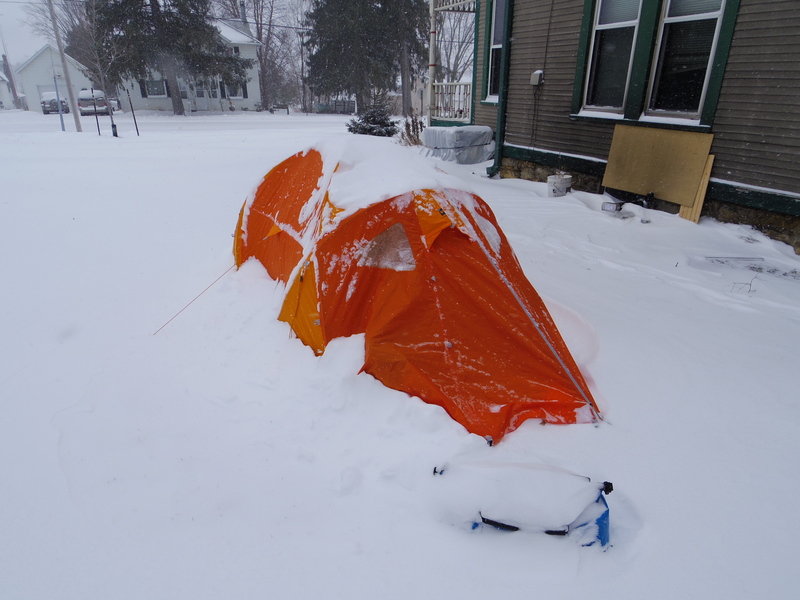 While also enjoying the experience of it and the fact that it will be rounding off this expedition, hopefully! You are one tough kid. Question: Wouldn’t the folks in Argyle let you sleep inside? Ahah! They would, but unfortunately for me they had a very furry hound so I didn’t want to risk it. 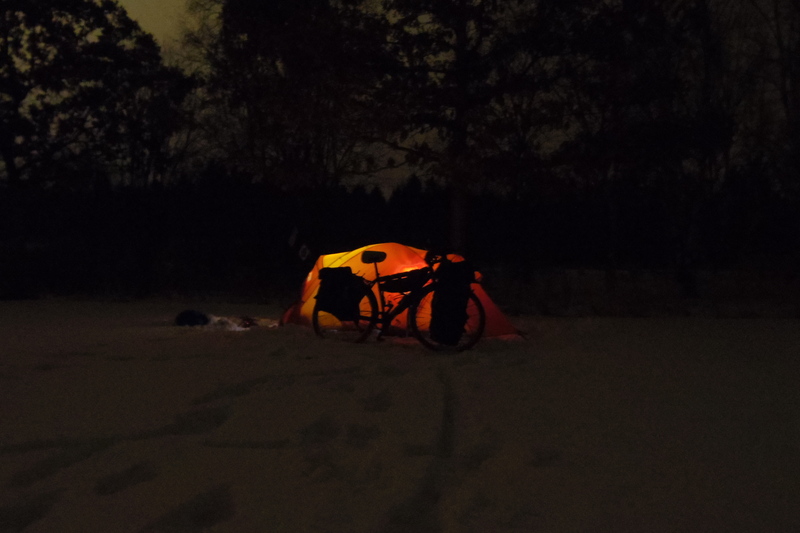 The following night, however, I stayed with a friend of theirs, inside and out of the snow. Golly nothing like baring ones sole, it is glorious that you can put so many emotions into words with such forceful meaning. There is a poet whom I revere, he died in 1971, that can do this, ironically his son lives in Vancouver, when you are through this and over the ocean, I promise to give you one of his books, his name is Ronald Duncan. Keep pedalling and smiling. I would love to read some of Donald’s poetry – thanks for the kind offer. I do love a good poem to learn and recite and think about. Susie – you rock, thanks for this. I totally agree that it is a treat to be so loved and have someone to love. I think that feelings take their own natural course and figure out a place where they settle and feel comfortable and manageable. Happy to say the slump passed and now all feels manageable again. For a wonderfully insightful beautiful bit of prose. Just reading Wild, and for those who have bee there and tested their mettle, there is a recognizable truth to hers, and to your story. Thanks for sharing this and inspiring other young women. ……and old guys like me too. Cheers and all the best on your sea adventure. I’ll be with you if in spirit. I have heard a lot about Wild but not managed to watch or read it yet. Glad you enjoyed it. Pull hard on those oars this summer! You always amaze us with your writings, so true in all aspects, your life throughout your travels, thank you for sharing all these things with us. We are so glad that you have such nice folks along your pathway. You are such an inspiration to us all as we follow your route edging that bit nearer back home. Bob and I were so honored to meet you and have you stay with us. We so admire your strength, courage, and perseverance as you undertake this journey. You came to our door a stranger and left as a friend. Should your travels ever bring you to our area again, you and Lucy would be more than welcome to stay with us. Until then, we pray that you encounter smooth roads, calm seas, blue skies, and friendly, helpful people on your journey home. What a lovely note, thank you. I really enjoyed my time with you both and it was a treat to have Bob as my first ever runner accompany me out the next day, too. Glad you enjoyed the film. I think Justine did a great job with that and it has just scooped it’s first award in Germany, which is exciting. Stop being soppy. Keep the pedals turning. Eat well. Rest when you have to. That is my psychology input. You chose to continue the London to London trip after having Lucy as fiancee. You could have decided not to continue and set up home with her last year. Eat chocolate and cheer up. I think that it’s easier to say than do sometimes when it comes to feelings. That’s what makes us human, no? Wrestling and settling with feelings and thoughts to figure out a path forward. I think it is very common for people to find it challenging to balance life choices with love sometimes. I am certainly finding it an interesting journey to do so. I do not know what makes us human. Your journey so far has been super human and you are capable of doing the Atlantic leg if you want to do it. Just keep the soppy self analysis to a minimum. Sorry if you find my writing soppy. I have always strived to share the ups and downs of my journeys, physical and emotional with people following my blog and Twitter so that people can share in it fully and see that you don’t have to be super- human to do this stuff. We are all only human and I think allot more adventure blogs and media coverage would be far more compelling if people were honest and open about all aspects of their journeys. We are too often presented with the stiff – upper lip brigade who pretend they are on some sort of pedestal and beyond the reach of mere mortals just because they took on a big journey. Well I say b******s to that and I make no apologies for sharing the trials and indecision of my journey. Margaret, a lot of people will disagree with you there. To my mind, Sarah’s honesty about the emotional challenges of her expedition is what makes her stand out – possibly even more so than her athletic achievements, though they are certainly second to none. If you favour a less demonstrative tone, there are a lot of other adventure blogs that you might prefer. Sarah, carry on with the soppy self-analysis – the rest of us love it. I’m not sure you need to be told by ANYONE – let alone a stranger that you are capable of rowing an ocean! haha! Goodness you’ve nailed 2 already!! We all know you can and most importantly YOU know you can. If we are offering psychological advice then mine would be to… keep the soppy self-analysis COMING, it keeps it real and no one else seems to have a problem with it in fact – it makes them more in touch with you and can relate what your feeling to their lives too. Perhaps if Margaret were going through what you’re doing her blog advice perhaps maybe a little different. If it were arrogant, egotistical and pointless blogs people wanted to read instead then I can definitely direct her towards and recommend some reading that would perhaps float boats a little better (pun intended). Soppy to one person is honest and open to another. Sarah is sharing her journey from the heart as she goes, and that’s exactly what she needs to do. You’re not in a position to command her to change the way she tells this story. Support the girl! Of course she is capable! She’s done two oceans already!! As far as keeping soppy self-analysis to a minimum, not so sure. I agree that this is what makes us human and I think it’s clear from everyone else’s responses that they enjoy the insight Sarah has offered to us. I don’t feel that criticising someone for being open about their feelings or the decisions they have made is a healthy perspective, in my world at least. And that very much comes from a place of each to their own – if you find it too soppy, no problem, but others may not. Personally, I would never presume to speak on the behalf of everyone who’s reading it. If you don’t enjoy the self-analysis then you could always not read it! I see that on the tracker map you are somewhere in Ohio, here in Jackson Michigan we are cold, Stay warm, you are one tough woman, wish you the best of luck and blessings. Thanks for calling the local paper Chuck and for stopping to say hi. It was a lovely ride on the Old 30 out of town. Thanks Sarah for getting your fingers busy and giving us an update…….was worried I wasn’t going to hear more about your biking across the US of A. Keep up the good work, pump that chain and don’t worry Lucy will be there when you are !